What part of the Quadratic Formula dictates the "types of zeros" an expression will have? Make sure you can define and identify the following terms as you go through the lesson. Watch the video (if necessary) on solving a Quadratic by the Quadratic Formula. Watch a video (if necessary) on Using the Discriminant. 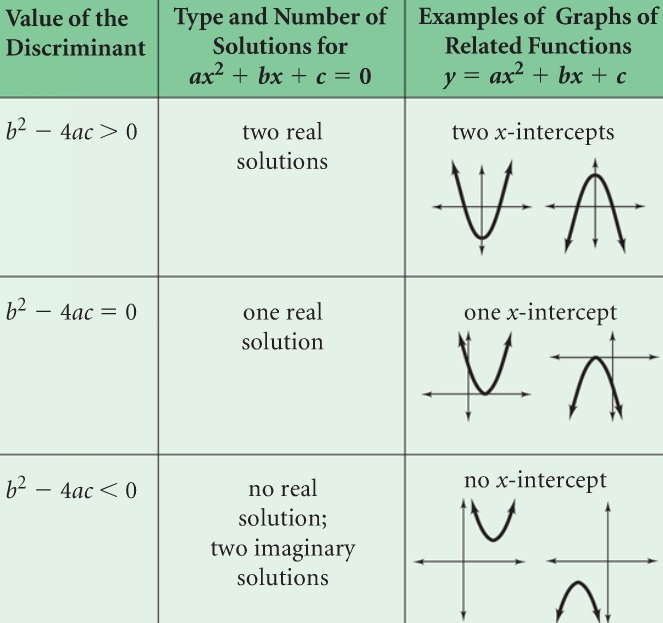 What does the Discriminant tell us? Watch a video (if necessary) on complex solutions and the Quadratic Equation. Desmos activity with the graphs of Parabola's in standard form! Take a quiz on Lesson 5-8.